An exercise bike based fitness regime couldn’t be easier in our view. The bike has remained quite a popular choice for home gym equipment even with the arrival of cheaper treadmills and the newer elliptical trainers. Why it’s so popular is it’s main strength. An exercise bike is light, takes up little space compared to other home gym machines, can be stored easily when not in use and plus you can do it whilst watching TV or listening to music. An exercise bike is easy to use as it doesn’t require much skill as with running on a treadmill – an action many find challenging. There is also little chance of injury if you train sensibly. However, because you’re only using the legs you’ll have to train for reasonably long periods of at least 30 minutes or more to get the full benefits. If you’re looking for a more challenging overall body low impact exercise you might want to consider buying an elliptical cross trainer. One problem with using any piece of home gym equipment is maintaining your motivation. Using the same machine day-in, day-out can get a little boring. If you an see the results this can help but with a bike this may take a little longer. However, because you can place it in front of the TV boredom may not be such an issue. Also most exercise bikes come with pre-set programmes that take control of your bike to change resistance levels to simulate hill climbing. This saves you having to keep pressing buttons and also adds variation to your training. Pre-set programmes may include hill climbs, fitness tests to measure your progress, resistance training and heart rate controlled exercise. Heart rate controlled programmes allow the bike to make adjustments to keep you in the fat-burning zone. This may be done by upping the resistance on the pedals if your heart rate begins to drop below a pre-set beats-per-minute or by increasing a minimum speed level. Your pulse can be measured by either grips in the handle or by a chest strap that sits over your heart and transmits to a chip in the bike’s console. This is a ore accurate way to measure heart rate but does cost a little extra. Many of the higher priced models will keep a record of your progress so you’ll be able to see how far you have come. This can help with maintaining your interest and gives you a goal to aim for. Most machines that do this can maintain training records for more than one person. 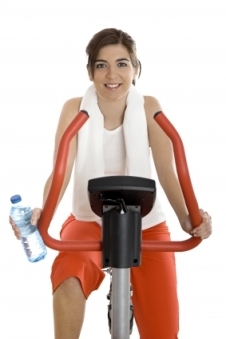 There are now a number of different types of exercise bike with each offering a variation on training and benefits. The standard bike delivering the benefits we’ve mentioned above. Considered to be a very safe form of exercise for people recovering from injury or illness but also suitable for the very fit as many find the position and seat more comfortable than an upright bike. Also uses slightly different muscle groups than an upright. The latest development in exercise bikes and proving very popular at gyms. The spinning bike is designed to deliver more cardio-vascular training and have a higher fat-burning potential.